Buzz! Buzz! Buzz!The sound of 60,000 swarming bees was loud in my ears and the hair on my arms was beginning to stand on end. I slowly took a couple of steps back, making sure not to make any harsh or quick movements. 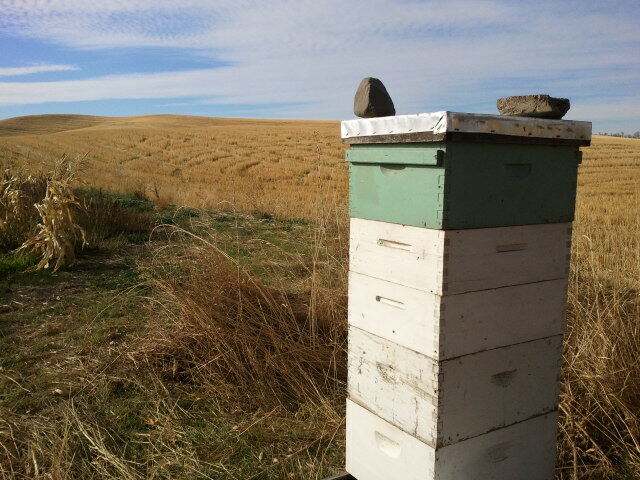 Jake had told me that the honeybees wouldn’t sting if I didn’t do anything to make them feel threatened. Since I am allergic to wasps, I was naturally afraid of these small insects flying around me in the air (their bites/stings are not the same). However, I quickly gained confidence and my fear melted away; the bees were friendly. One bee even crawled around on my shirt as another made a soft landing on my elbow. I let them, and they left me alone. 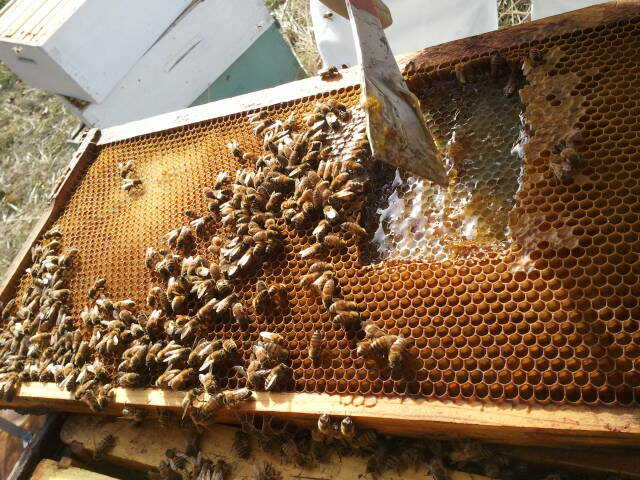 We were checking on the health and honey production of the bee hives at our farm. 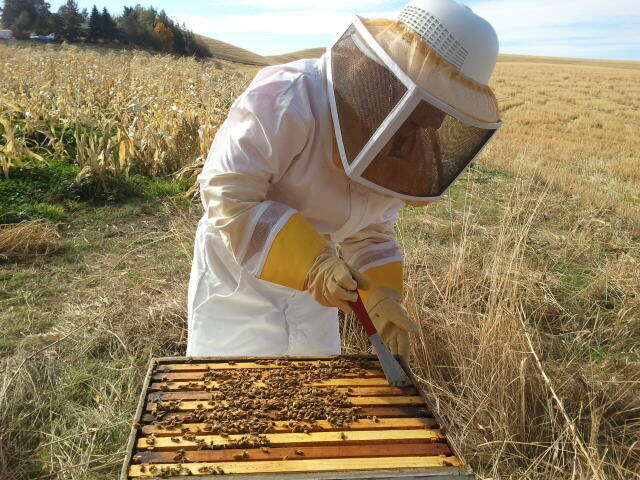 The first time I had ever been around a live and open bee box, this was a very exciting experience. 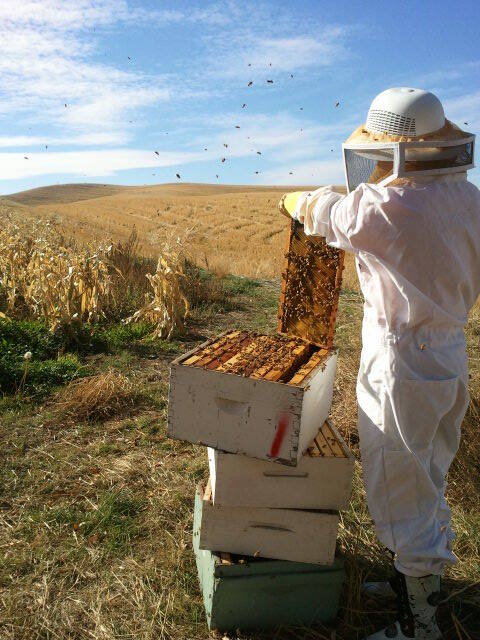 We have to check them regularly, in order to make sure the hive is healthy, creating a good stock of honey and we are able to locate a queen who produces new larvae. We opened section after section of the bee box, looking at the health of the colony and searching for the queen. When choosing a new queen, the bees are very picky when making the decision. You can try to create a new queen bee by keeping them isolated inside a container that is plugged with something sweet, usually a marshmallow. The hive then decides if they like the chosen queen and elects to release her by chewing through the marshmallow. They must make the right decision because the queen is the brain of the beehive. If the rest of the insects don’t approve of her leadership, they may choose to leave the colony. We located a section of honeycomb that was dripping with the delicious yellow-y goodness. We snuck a taste and it tasted fresh, like clover and marshmallows. The most raw honey I’ve ever had. It’s a strong antiseptic and the wax the bees create around the box is also a powerful germ buster. 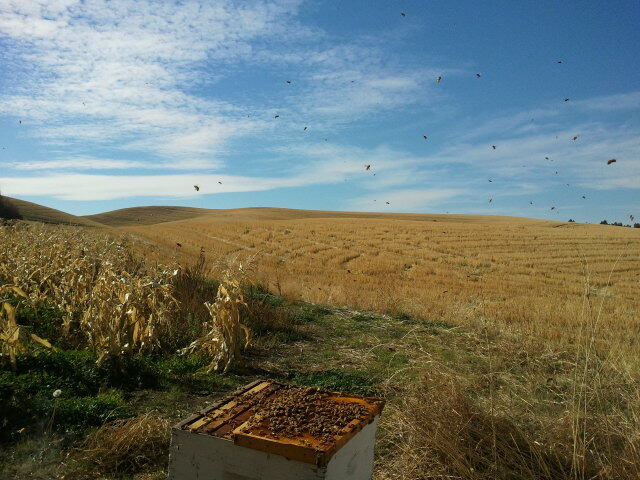 The swarm of bees grew louder the longer we were tending to the hive. The buzzing grew in my ears and culminating in a cacophony of sound. Instead of being afraid like I was when we first opened the box, I felt peaceful. ← Exciting! Our Produce is at the Local, Natural Grocery Store! Good for you! So exciting to see results from tending to nature’s creatures. It is exciting! I love taking care of them!